This month Danielle Park and Natalie Greetham at Madeira UK are on hand to provide you with some advice and solutions for embroidering onto knitwear. As we head into winter a large portion of embroidery will be onto knitwear, from beanies to school uniform jumpers and everything in between. 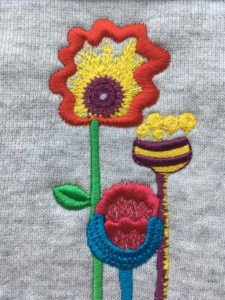 Embroidering onto knitwear can be tricky, from sinking stitches or puckering, to holes forming in your fabric. However, Madeira as always, offers solutions for these potential pitfalls. Sinking stitches can really compromise the finished look of your embroidery. Combat this by using a water soluble topping which will create a stable surface for embroidery, leaving a crisper finish. Always tell your digitiser which material you will be embroidering onto, or if digitising yourself, ensure you select the correct fabric setting in your software. It completely changes how the design will be created, underlay stitches and pull compensation need to be adjusted to fully stabilise the design. Another key point to consider is the direction of the vertical grain or rib of knitted fabrics and jerseys. To avoid fabric distortion, you will need to ensure your stitch direction is not also vertical. Using horizontally angled underlay stitching will reduce the fabric stretching and design distorting. Puckering can occur if your fabric is over stretched when framing or if your design has too many stitches. Hooping the garment with the correct amount of tension, making sure it is taught but not over tight and ensuring there are no more than three layers of stitching will help avoid puckering. Using incorrect needles or an unnecessarily high stitch count can cause holes and ladders to form around your embroidery. Always ensure you use a ball point needle so that during stitching the needle pushes the fibres of the fabric aside and slips through the structure of the knit, rather than piercing it.